The oil cooler is an essential component of any vehicle may it be a sedan, an SUV or a full-fledged truck. It is crafted to help your vehicle run hassle-free day by day. It doesn’t matter if you own an expensive vehicle or a cheap daily like a Toyota, you will have to take care of the oil cooler so that it runs perfectly. The transmission oil cooler rarely ever needs any service, so it is highly unlikely that you would ever put your eyes on it. Regardless, the proper function of the oil cooler is necessary for a healthy vehicle and if it gets worn out you can get in some big trouble. The true function of a transmission oil cooler is to rid the transmission oil of excess heat. Basically, oil is used in transmission to reduce friction that is created when gears change their position. And from what we know about friction it can be reduced but not eliminated. Furthermore, friction creates heat that has to be dispersed. In a transmission oil cooler, this heat is channeled through the transmission oil. This oil moves from an outlet in the transmission to the radiator. The radiator cools the oil just as it cools the water, with the help of a coolant, and sends it back into the transmission. 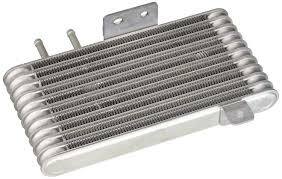 There are two types of transmission coolers out there, we have talked about one (the radiator system) another one sits right near the A/C condenser. both coolers have the same effect and differ only based on their practicality and operation. The right temperature of oil makes it easier for the transmission to work effectively. You can also have a heat exchanger between the coolant and the transmission fluid. The good news is that if you are getting your vehicle serviced as usual like getting routine oil and filter changes, then your car’s oil cooler should last a very long time. However, even regular service cannot save a component from failure. An oil cooler will show some signs before it fails completely. You just have to have the proper knowledge to notice these symptoms and take the proper action. Here we have listed a few symptoms that can help you along your way. One of the first signs you will notice before your oil cooler stops working is leaking oil. This leak can happen in many numbers of places. The oil can either leak near the transmission outlet, near the radiator joint or at the back-end of the transmission. The former two will create a small puddle right beneath the front-end of your vehicle. This leak is easily visible and can be spotted every time you come back to start your car in the morning. If the leak is at the back-end of the transmission near the shaft, you might not easily see it. Therefore, it is advisable to always keep an eye out for an oil stain right after you pull your car back from your driveway. Otherwise, you will keep on damaging your transmission and end up paying for a lot more than an oil cooler. The oil inside the transmission is necessary to maintain a healthy work environment for the gears. If the oil is leaking or if it is not being cooled down to working temperature, it is possible that your transmission starts making clunky noises every time you shift. When the oil is heated and it reaches a very high temperature, it starts to boil and evaporate. This action can cause the oil levels in your transmission to deplete and eventually make it harder for gears to shift effectively. Fortunately, you can feel a change in your gear shifting. If it is taking you much effort to shift a gear, especially a low gear, you are possibly having gear oil problems, which is caused by a failing oil cooler. 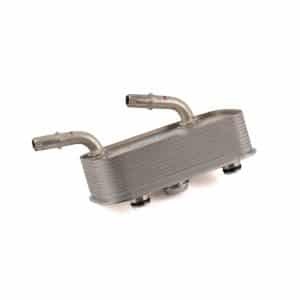 The oil cooler receives transmission oil through a few hoses that are interconnected between the transmission outlet and the oil cooler in the radiator. The hose used for oil transfer is usually very rigid and tough, which means that they can withstand a lot of pressure. In other words, they do not get damaged very easily. However, if they get damaged, they leak oil. When oil does not reach the oil cooler in its entirety, it does not get cooled properly and you experience an overheating transmission. When the gearbox does not receive cool oil due to oil cooler failure your gears do not shift properly. Improper gear shifts will create extra drag which the engine has to overcome. To do that the engine has to work harder than usual and that causes the engine to overheat. If you are driving your car and experiencing slow shifts and then you see your temperature gauge rising, take your car directly to a certified mechanic. A mechanic will have the appropriate remedy for your car problems. Any of these symptoms will require you to take your car to a professional mechanic. A mechanic will check your transmission fluid and then check for a leak. If there is any indication of oil cooler failure you will be advised to either opt for a repair or think about replacing the oil cooler. Repairing the oil cooler will be cheaper than replacing it since changing the oil cooler will require you to make alterations in your radiator. The oil cooler is basically just a tube that goes through the radiator. If it is worn out, your mechanic will have to replace it with a new one, which would increase labor costs for you. Usually, an oil cooler replacement will cost you around $100-$200 excluding labor costs. Depending on the amount of work the mechanic has to do, you can expect $100 or more as labor costs. If you want to avoid paying so much money, make it a habit to check all the fluids of your car regularly without fail. This simple exercise will help you make a diagnosis earlier and make the necessary repairs.